Papa John’s International Inc. has named Marvin Boakye, left, the pizza chain’s first chief people officer. Boakye will lead the Louisville, Ky.-based company’s human resources department in developing the company’s talent management strategy. He will report to Papa John’s president and CEO Steve Ritchie. 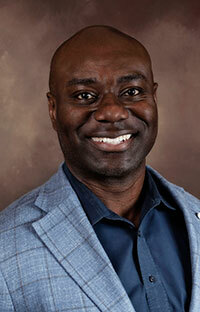 Boakye previously served as vice president of human resources at petroleum company Andeavor in San Antonio, Texas. He replaces senior vice president of people operations Bob Smith, who retired from Papa John’s in August 2018. Human resources strategy was previously led by a senior vice president role, the company said, noting that the more senior chief people officer role will also be responsible for training and learning and development for Papa John’s employees. "It is a reflection of Papa John’s putting an even greater focus on our people and their development,” the company said. Papa John’s company culture has been a key point of discussion in an ongoing contentious back-and-forth between former CEO John Schnatter and the company he founded. For its part, Papa John’s has taken steps in recent months to establish a more positive and inclusive image. In late August, Ritchie posted a message on Papa John’s website outlining the company’s “core vaues,” noting that an independent audit of the company’s diversity and inclusion practices was underway and that the company’s leadership had recently completed “unconscious bias” training. A few weeks later, the brand introduced the Voice of Papa John’s campaign, which highlighted the experiences and voices of company franchisees and managers. The campaign briefly lifted the company’s same-store sales by 2 percent, during which was otherwise a tough third quarter for Papa John’s, with a 9.8 percent drop in North America same-store sales for the quarter ended Sept. 30. As of Sept. 30, Papa John’s International, Inc. had 5,247 locations worldwide.